I love this page. You can make paper craft cars of all sorts, and for some reason, out of the blue, a cat. PDF here. I wish I knew how to get good deals at a flea market. If you’re planning on getting into the fray this flea market season, check out this post on Planning Your Attack. I want to try a furniture refashioning project this summer! I’ll have to scan some markets and use these great tips to find a chair with some promise. The irony. Magazines, destined otherwise for the recycle bin, reused/recycled in a different way: to make something that will contain the only things you can’t recycle. This is a guest post by my IRL friend Liz who is fabulously creative and just got a new camera (of which I am envious). Liz, you are welcome to guest blog any time you like! Back in December, there was some talk of buttons over here that really caught my eye. 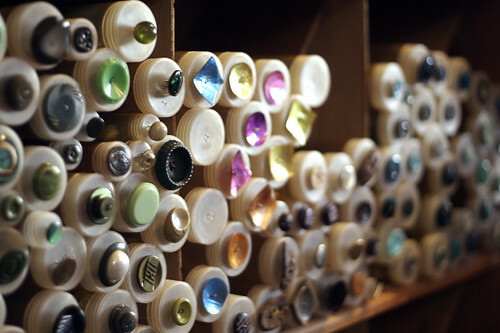 Buttons are beautiful, varied in colour and design, and occasionally functional – what’s not to love? The only problem I have with buttons is getting my hands on some. There’s usually a rack at the local fabric or yarn store with some practical button options but nothing particularly imaginative, and certainly nothing affordable in bulk for crafting. Beyond crafting, the acquisition of buttons has been a nagging concern of mine ever since I started a cardigan out of thrifted yarn over the summer. I’m piecing together two (formerly) very ugly sweaters into what will be a simple, modern cardigan. Cardigans need buttons eventually, but I figured I’d cross that bridge once I’d actually finished a sleeve or two. On Rue St. Denis in Montreal, there is the most amazing store. You walk in to see a giant bin of buttons, to be purchased by the bag full. 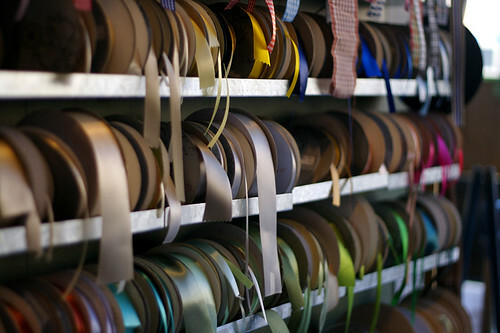 All the walls are lined with either tubes of buttons (sorted by colour and shape) or spools of ribbon. Just walking inside is inspiring. I started thinking about the things these notions could decorate, and of course, my cardigan. It only has one sleeve so far, and that sleeve is too narrow. I’m going to have to rip it back, but it will be ok. I’ve got buttons to work for. There’s also a sale at Pureknits. KnitPicks released a new sock yarn called Risata, a wool/cotton/other blend. This is my dream trip in October. I’d like to go to Rhinebeck, if I have that weekend free. I don’t think it will be possible, but I’d like to go back to where I grew up if I’m going to be in the neighbourhood. And hey, since I’m there, WEBS WEBS WEBS. Anyone else going to Rhinebeck? 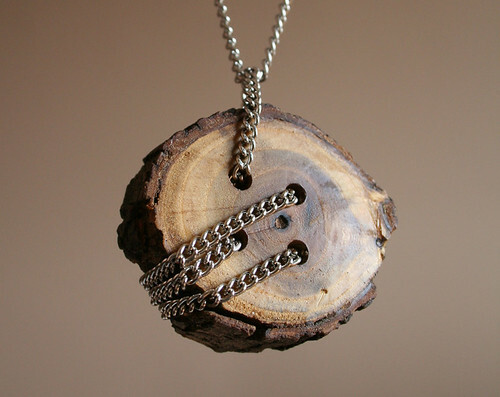 If you have a tree in your garden that can stand the loss of a branch, try making some wooden buttons. There’s a nice step-by-step at Pikku-Kettu Knits, and examples of the neat ways you can make buttons are at SisÃ¤inen villapaita. I don’t speak Finnish, but if you do, there might be some great tips over there. I have no idea what it says, so I apologize if it’s a tutorial on how to poison vagrants by coating your buttons in cyanide. I do not endorse coating buttons with cyanide. You will need a piece of dowel [Ed: or a branch!] 1 inch (3 centimeters) in diameter. Place the dowel between pieces of cardboard to shield it, and put it in a bench clamp or vice. Father [Ed: lol are you also picturing him in a sweater vest and horn-rimmed glasses?] can drill two or three holes into the end of the dowel. Center them so you can use them for the holes in the buttons. If you don’t have a drill with a bit, make holes by twisting an awl or leather punch into the wood. Use a hand jigsaw to saw off rounds of the dowel to the thickness you desire for a button. If you have a triangular file, you can file a design in the top of each button. Make four or five similar buttons so you can use them for a set. Use a fine sandpaper to smooth off the rough parts. You can stain, paint, or wax the buttons to the desired finish. These instructions are especially useful for people making a multitude of buttons, because you only have to drill holes once. If you’re planning on countersinking your buttons with a special drill bit (this reduces thread wear), you’ll obviously have to do them individually. Alternatively, you could do them all at once with a thin bit and then once they have been cut into individual buttons, use a larger bit to drill out each hole by no more than a millimetre or so. I’m going to ask the parents if I can steal a branch or two when I get back home. There was a huge storm in Toronto when I was there a week ago, so I might sneak into the forest on the edge of Kingston to see if it took out a few branches over here. I don’t know much about pruning, but if you need to prune your trees, that’s an easy route to getting a branch or two. If you want to steal some branches from the neighbours after they’ve done some gardening, it’s probably best to ask them permission first. That also gives them an opening to tell you about any diseases or parasites that could be clinging to the branches. That way, you don’t have to worry about getting dutch elm disease from your cardigan. Let’s pooh-pooh Lion Brand together! I want to link to this post about why Lion Brand isn’t the yarn of the proletariat because I agree with it completely and I want as many people as possible to read it. One of the things that annoys me most about Lion Brand is their “cheapness” hype. If you really can’t afford cashmere, buy from KnitPicks or unravel a sweater. DON’T BUY LION BRAND. Their yarn is cheaply manufactured and extremely overpriced. The willingness of knitters to pay for crap means they can put on a huge markup, and… tada! You get to pay $6 for 100 yards of 50% wool, 50% acrylic instead of the same for that amount of 100% alpaca. Yarg. Yarg! My birthday was a little while ago, and my parents asked me if there was anything I wanted for my birthday. Interchangeable needles (and more importantly the case to carry them in, so I wouldn’t lose my needles in the nooks and crannies of my room) immediately came to mind. I’ve been lustin’ on the KnitPicks Options ever since I heard about them, but I’d also noticed that only went down to a 3.5mm, and I’m a loose knitter so for anything laceweight I need 3mm or lower. I’d heard the Denise Set wasn’t as good, but that it also went down to lower sizes, so I was torn about getting the KnitPicks and sacrificing the smaller sizes. But you know what? That was a filthy lie someone told me. I just checked, and the KnitPicks needles actually go down to a smaller size than the Denise needles (who only go down to a size 5).